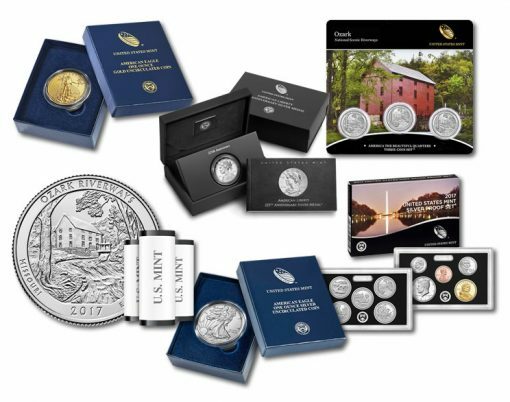 June will be one of the most active months this year for United States Mint product releases. The Mint scheduled product launches across six different days, doubling the amount needed for releases in May and June of last year. Products for the month include uncirculated American Eagle gold and silver coins; rolls, bags and sets of quarters honoring Missouri’s Ozark National Scenic Riverways (see photos of the quarter); the annual Silver Proof Set; and one of the five different 225th anniversary American Liberty Silver Medals. Below is a table that summarizes the scheduled products and their prices. *Pricing for the American Gold Eagle can change every Wednesday depending on the weekly average of LBMA gold. Sale dates and prices are subject to change. All the products launch at noon ET on their day of release. Place orders using the U.S. Mint’s website at catalog.usmint.gov or by phone at 1-800-USA-MINT (872-6468). Can’t wait to see how it all plays out. The Liberty medal is a waste of good money. Fugly obverse with no mintage limit. I can have two ASEs for the price of one medal: it’s an easy choice, and the ASE’s Liberty is attractive. if you want one or more of these just wait, within 18 months they will be silver spot price plus $3 at any major coin show. remember they have no production limit. buy regular american silver eagles, they are just silver spot plus about $2 and will go up as silver goes up. the liberty medal is a poor choice as an investment. It’s being called the “Obama Medal” I hear, because that is certainly not Lady Liberty. It will be a huge failure, just like his Presidency. I said a prayer for you Gary Lomax. And I said one for you, Joe Brown. Wake up! By the way thanks i’ll take all I can get. Enjoy your collection.